I would put visiting the dentist pretty much up there with living in Hello Kitty Hell. When you put the two together, you basically have the makings for a complete horror show where stuff like the Hello Kitty tooth becomes a permanent fixture in your mouth after getting a Hello Kitty root canal. that’s kinda gross. but the white case is cute! 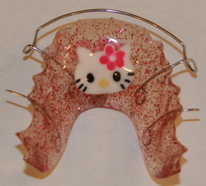 i suppose hello kitty dentures are up next. 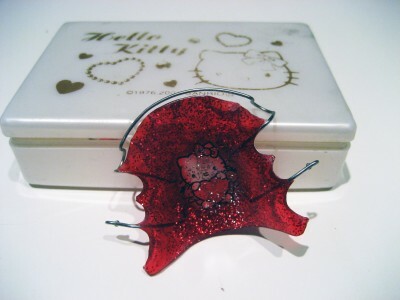 would be cute if it were any color other than RED, makes it look like hello kitty is encased in some kind of blood jello. bloody retainer=ick. as you know, I LOVE Kitty, but that is just weird on many levels. I have to wonder, why do these pro HK folks think they have to rub this crap in our faces? If they didn’t do that, we could tolerate it a whole lot better. It is childish, selfish, UNloving and maybe even hostile to deliberately push HK in the face of someone you KNOW hates it. @ Harriet in particular, how would you like it if your bf kept giving you stuff he KNOWS you hate? It’s disturbing yet intriguing at the same time… If I had to wear a retainer, then this on would make me feel a bit better about it. I do agree w/jesi though, the red makes it gross- pink would be better. As for the comment left by metal m mike, sorry to break the news to you but those items are already out there. Take a look at HKH archives and you will see that it’s only just the begining. @Sharon, I wouldn’t really be bothered to say the least. I’d be grateful at least. Okay, I seen some weird stuff, but this is pretty weird, just saying. @Sharon, hammer, nail head interface 100% successful. @Kitteh!! – I very rarely get serious presents. People know fine well that two of my fave things are HK and Mario (I have lots of posters on my bedroom walls :D) but I only ever get merchendise when I ask for it. A lot of the time people get me either money, clothes or perfume. Because I’m a girl, and those are typical girly things. The 2nd retainer doesn’t look neat. But at least if u lost yr HK retainer then u could find it easier. Revolting. Especially that first one. YUCK. You say “oral fixation” like it’s a bad thing. omg, how do u get it? lol. i would ask my orthodosit if i could have it. hahahahha. um, hello kitty tampon???!?!? oh wow!!!! i want!!!!! i want all hello kitty stuff…. 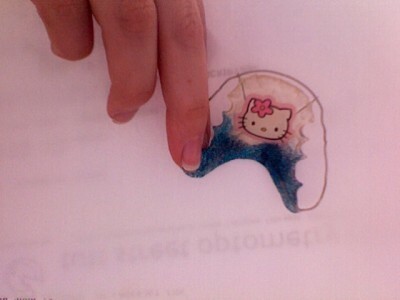 I have a hello kitty retainer too. Mine isnt as cute as the ones above. The dential assistant didnt want to do it at first but I talked her into it. 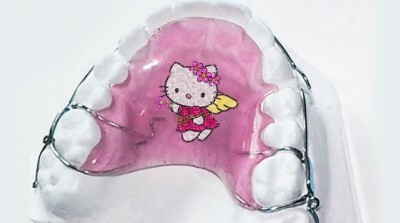 Where can i get hello Kitty retainers?! Please, heeelp! I know mmy orthodontist doesn’t do this.